One can also use other aliphatic and aromatic aldehydes, these often do not dissolve in water, simply emulsify through shaking. In order to convince onself of the specificity of the reagent one could also test in parallel a ketone such as acetone. Propanal smells rancid, if desired ventilate. 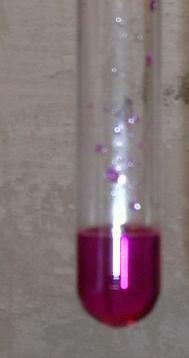 Add some aldehyde (actually one drop is enough) into the test tube and dissolve with approx. 1 ml water. Add some drops of Fuchsin sulphuric acid, sway back and forth. Soon a pink-violet color develops, which then rapidly becomes more intense. The diluted solution can be discharged into the drainage. If one uses environmentally dangerous or toxic aldehydes, then properly dispose of as hazardous waste. Schiff's reagent forms with aldehydes a colored bisulfite adduct. This verification is very specific and very sensitive. Of own device, similiar to that of many organic lab exercises.